The Yeoman (F) marked a new era for the Navy. Women were working alongside men, albeit because of a loophole in the Naval Reserve Act of 1916, which never said that Naval service was limited to men. Most of the women served in the Washington, DC, area, but they were ultimately stationed in bases across the country, as well as overseas in Puerto Rico, Guam, Hawaii and the Panama Canal Zone. Five women were sent to France with Naval Hospital Units. 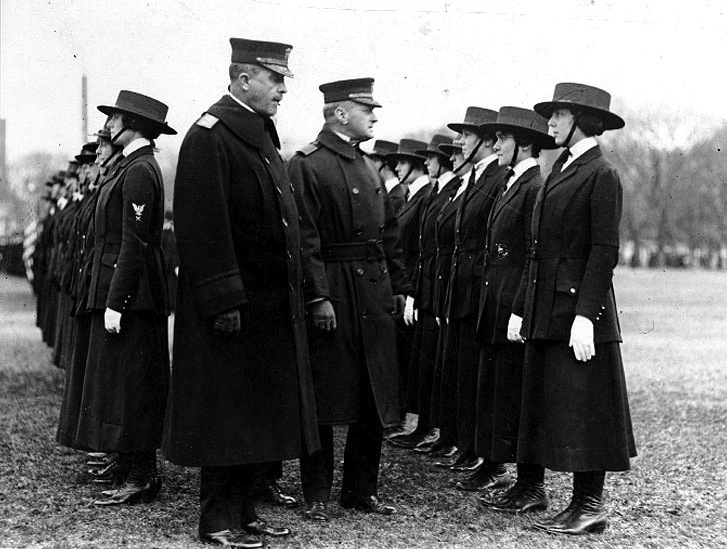 This photograph, circa 1918, shows Yeomen (F) being inspected by Rear Admiral Victor Blue (left center), Chief of the Bureau of Navigation, on the Washington Monument grounds. It comes from the Naval History and Heritage Command.